It has been almost five years since the Station Fire was set by arsonists along Highway 2 near the base of Mount Lukens. I was there on August 26, 2009, as it started. I was also there last week when the Station Fire General Closure Order expired. This opened up Strawberry Peak loop, a trail system that has been the focus of many different groups for the past eighteen months. Though it's a significant milestone, there is much more to be done. 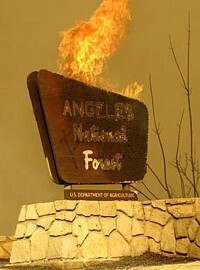 This takes be back to a June 2010 Mountain Bike Magazine article about the Station Fire. While the magazine is no longer published, a copy of the story is archived on our web site. Reading it will help you realize what has been accomplished so far. We all wished that things could have happened faster, but the assumptions of the article have held up. Matt Lay/Mount Wilson Bicycling Association, and I were featured in the article as mountain bikers on a mission to help restore the trails. Both CORBA and the Mount Wilson Bicycling Association have lived up to that promise, with many trails affected by the fire now open due (at least in part) to our efforts. We have to thank our volunteers, our members, and REI for their generous support, all of whom helped make it possible. Of course, mountain bikers were not alone in the effort to restore trails. 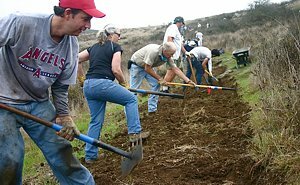 Many nonprofit groups, trail user groups, and individual volunteers continue to make significant contributions to restoration and maintenance. Professional crews including Bellfree Contractors and the LA Conservation Corps have also been involved. As mentioned, the work is not yet done. The general closure expired and was replaced by a much more manageable list of closed trails. 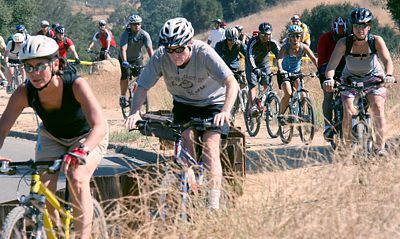 Among them are several fire roads and at least two local mountain biking favorites: a section of the Gabrielino Trail and the Ken Burton Trail. CORBA and the MWBA have pending work plans for both trails, and the Forest Service is working to reopen the fire roads. Stay tuned. And there will always be a need to do trail maintenance, above and beyond restoration efforts. Trails don't maintain themselves. Join us. At the 2014 California Trails and Greenways Conference, CORBA Co-Founder Jim Hasenauer was honored with a lifetime achievement award by the Trails and Greenways Foundation. Jim has been at the forefront of mountain bike and trail advocacy since helping CORBA get started in 1987, and IMBA in 1988. He was inducted into the Mountain Bike Hall of Fame in 1988, and was also present at CORBA’s induction in 2013. We’re fortunate to have such an informed, eloquent, and passionate ally, still working hard to help guide us into a better future for off-road cycling and trails. We owe him a debt of gratitude for his continued involvement in CORBA, and congratulate him on this worthy acknowledgement of his contributions to the trail community. 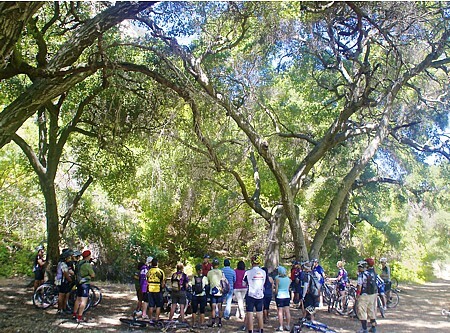 Last weekend, on the May 31st one-year anniversary of Danusia Bennett-Tabor’s passing, an informal memorial service/ride was held at Malibu Creek State Park. 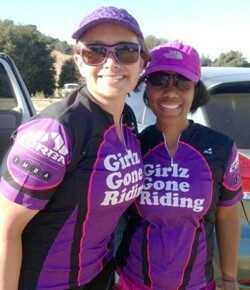 It was a solemn but cheerful event, organized by Wendy Engelberg and the Girlz Gone Riding volunteers, a group that started with Kim Cofield, Wendy and Danusia. Wendy also wrote a wonderful report about the memorial ride with photos by Jesse Ettinger and others. Read it on the GGR blog. There were many cheerful moments, interspersed with a few tears, as friends told stories about their wonderful experiences with Danusia. Steve Messer made sure everyone appreciated how much she did for CORBA, and how her work continues to guide us. Recently, CBS did a special report on the cancer and procedures that ultimately took Danusia’s life. Her husband Don told her story in the CBS report on Leiomyosarcoma. Almost $1000 in donations were accepted on behalf of the Sarcoma Alliance, followed by the real celebration: riding. Thanks to everyone who came to Malibu Creek to remember Danusia. We have a Niner frame waiting for some lucky volunteer (see the photo at the top of this newsletter), plus other great prizes including grips and saddles from Ergon! April 25 - 27, 2014: Report on the Annual Santa Monica Mountains Trailwork Days in Point Mugu State Park. 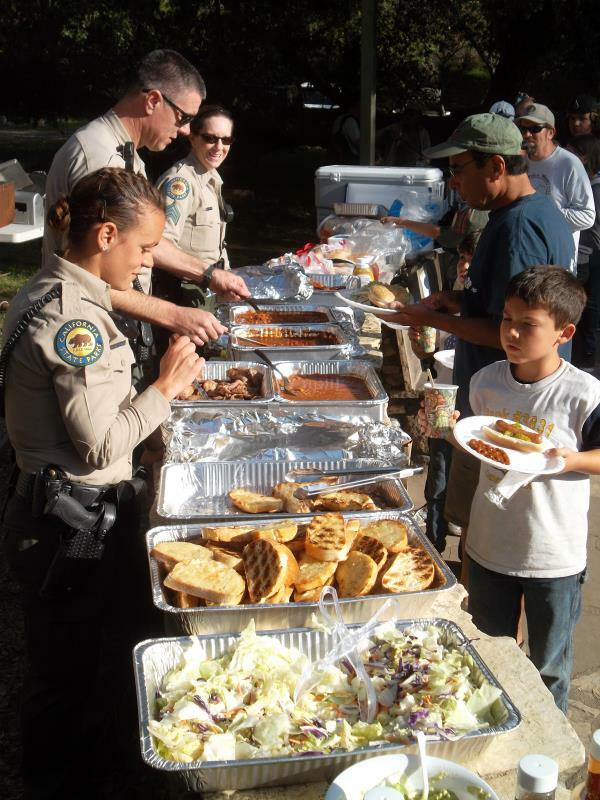 Rangers serve the barbecue on Saturday night. As well as hot dogs, there was chicken, tri-tip beef and veggie-burgers. A large number of volunteers from CORBA, the Santa Monica Mountains Trails Council, the Sierra Club and other organizations, and individuals gathered for the 33rd annual Santa Monica Mountains Trail Days at the Danielson campground in Pt Mugu State Park. Folks could arrive Friday evening, camp overnight, help with the trails on Saturday, enjoy the barbecue dinner prepared by park staff, win some cool swag in the prize give-away during dinner, camp overnight, help with the trails on Sunday, have lunch back at the campground, then depart for home. Of course only a few people stayed for the whole weekend, but many camped for at least one night, and most stayed for the Saturday BBQ and prize give-away. On Saturday, there were about 110 volunteers who split into five groups. The largest groups worked on Old Boney Trail in the State Wilderness Area and Sage Trail. Others went to the top of Hidden Pond Trail and youngsters under 10 cleared small rockfalls off the Sin Nombre and Two Foxes Trails. A dozen hardy souls (with hardy soles) hiked almost three miles (and up about 1400') carrying tools to work on the Chamberlain Trail, also in the wilderness area. The group of about 30 volunteers who worked on Sage consisted of 15 CORBA folks, a few geocachers, and others. The trail had just been SWECO’d (plowed by a small trail-sized bulldozer) to level the trail, smooth out the ruts, and narrow it. The trail is narrower now because it used to be the full width of a fire road, and now the travel surface is about half as wide. The SWECO is only able to get so close to the edge, so the work consisted of pulling down the berm (pile of dirt) the machine left at the outside edge of the trail, sloping the trail about 5-degrees to the outside so rainwater will run off, rather than down the middle, and removing the larger rocks. SoCalGas will conduct a hydrostatic pressure test on a segment of one of their natural gas transmission pipelines in Sullivan Canyon. Hydrostatic pressure testing is a process that uses water to exert pressure on a pipeline at levels greater than its usual operating pressure to assess its soundness, often referred to as its integrity. The construction work will take place at several locations starting west of the Sullivan Canyon trailhead at the end of Queensferry Road and about a quarter-mile northwest of the trailhead. Work will begin in June 2014, and last about four to six weeks, although weather and other factors affecting safe working conditions could change the schedule. Normal work days will be Monday through Friday 7:00 a.m. to 7:00 p.m., however, some activities may extend the hours. Please keep an eye out for GGR's new website that will be up in the next few weeks! The website will have the Google calendar of events that matches the Facebook events, the entire line of GGR cycling clothes to purchase, blog, an email sign up to keep up with announcements and events, and the MOST important a FORUM! GGR's Face Book page is so busy that we needed to create a forum so posts won't get lost. The forum will be open to all GGR members to post and respond. Threads can be relative to cycling, fitness, nutrition, etc. The Wenches with Wrenches workshop scheduled THIS Sunday is now cancelled due to Vince from JRA Bikes & Brew breaking his ankle. JRA was hosting the workshop. We wish him a speedy recovery! This workshop will be rescheduled at a later date. Saturday June 7th is the next skills clinic.